Completing two layouts a night, two nights in a row makes me happy! Now my husband on the other hand...I think he's wishing I hadn't strung my stuff out in the living room! The other night I finished this 2-pager of crazy shots of us in '08. I love my three guys so much! Other than adding some Queen & Company pearls, the layout is just the My Family papers. 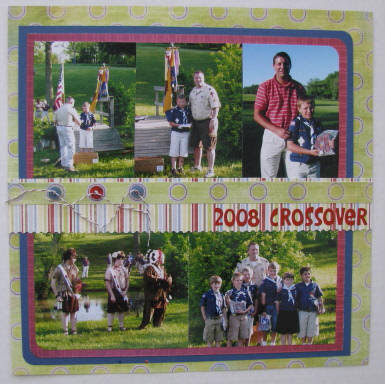 My title is a mix of new Cosmo Cricket Tiny Type alphas, SR letter stickers and cool new Thickers. I loved this next sheet of patterned paper and wanted as much of the design to show as possible. I rotated the paper around a few times and finally decided to use my three photos (2 of them really cropped down) on the bottom portion of the page. I added bling and pearls to the flower centers and then added my title - again a mix of SR stickers and Thickers. The love accent is cut from patterned paper and raised up with pop dots. The layout shows Blake with my sisters Adriane and Lindsey and my parents. Last night I reminded myself that I needed to get some more Cub Scout layouts finished for Blake. He's crossing over into Boy Scouts in just over a week. I was proud of myself for taking six photos, eliminating one, and cropping the remaining five down to fit on a single page layout. Cub Scouts are always tying knots, so I chose three buttons for my embellishment and tied them with twine. I left the twine long to resemble ropes. My last layout of the night came together surprisingly quick. I loved the "pieces of my heart" on the strip sheet and decided to add on it for my title. The lower part of the strip sheet had a "journaling box" design. I cut the center out to use it as a frame over one of my photos and journaled in the box beside it. It was a bit hard to leave so much "white space" in the upper right hand corner, but I did it. 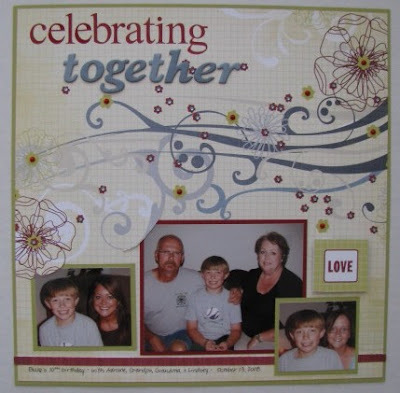 The "family" square in the upper left corner is adhered with pop dots for a little dimension. I also added the "corner" of Queen & Co. pearls. Oh, and I used my new punch that I got for less than 1/2 price at Joann's last week - another purchase justified! 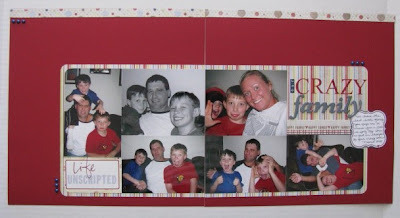 So far I've finished seven layouts using the "My Family" line! These are wonderful....my fave is "you are the pieces of my heart". I also love the collage of fun photos that you put together! The crossover lo is gorgeous. Great layouts Amy! Love this line, my fav is Wild Wheelers! Love that title! LOL! WOW! You are on a roll. These are awesome. I really like the last one--what a very sweet page. Gotta ♥ 1/2 price punches! That's where I seem to be spending my money these days... more punches! Your LO's are all adorable, Amy! You're a multi-photo page girl after my own heart!